Show These Items on the Desktop check boxes: Select or deselect these check boxes to choose whether icons for hard drives; external disks; CDs, DVDs, and iPods; and connected servers appear on the Desktop. OS X Yosemite deselects all four options by default. If you don’t want disk icons cluttering your beautiful Desktop, deselect (clear) these check boxes. When they’re deselected, you can still work with hard drives, CDs, DVDs, and other types of disks. You just have to open a Finder window and select the disk or disc you want in the Sidebar. Open Folders in Tabs Instead of New Windows check box: Selecting this check box spawns a new tab in the current window when you press Command and double-click a folder or disk. Don’t enable it, and Command+double-clicking a folder or disk icon opens it in a new window. The default behavior is for folders to open “in place” when you double-click (open) them, which prevents window clutter. If you want a new window or tab instead, press Command before you double-click. This forces the folder to open in a new window or tab (depending on whether the box is checked or not). After a delay (which you set via the Delay slider), the highlighted folder icon “springs” open. If you drag the item onto another folder now, that folder springs open. And so on. This continues until you release the mouse button, at which time the item you’re dragging is dropped into whichever folder is open at the time. Notice that each time you drag the item onto a different folder the previous folder springs shut automatically. That’s spring-loaded folders for you. As long as the check box is checked, you can make folders spring open instantly by pressing the spacebar, regardless of the delay you’ve specified with the Delay slider. 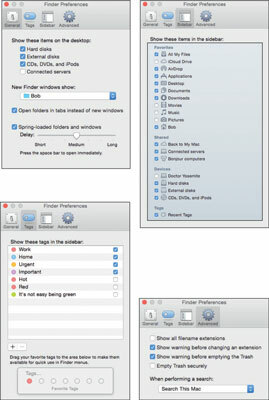 Prior to OS X 10.9 Mavericks, the Finder featured colored Labels; Mavericks took Labels to a new level, replacing them with the more powerful and versatile Tags. Labels weren’t particularly useful; you could assign only one label to a file or folder and they weren’t integrated with Opening and Saving files at all. In a nutshell, Tags do everything Labels did and much, much more. 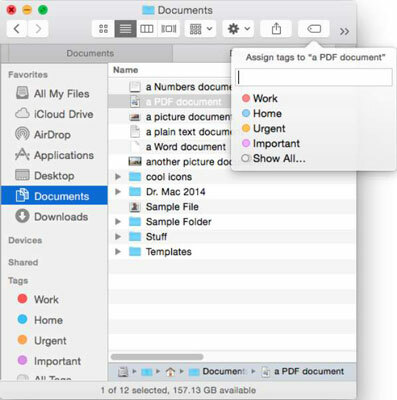 The Tags pane is where you manage your tags, which appear in the Finder’s File menu, the right- or Control-click shortcut menu, the Sidebar, and the toolbar. You can see a file or folder’s tags in Finder windows, Get Info windows and inspectors, and applications’ Open and Save dialogs and sheets, and you can use them as criteria for searches and Smart Folders. A sheet is nothing more than a dialog that’s attached to a document window’s title bar and can’t be moved. Some apps use sheets, other apps use dialogs, but either way you’ll see the same options. Click the Tags button on the toolbar and click one or more of the Tags. To remove every instance of a Tag from every file and folder on your disk: Right- or Control-click the Tag in the Tags pane of Finder Preferences, and then choose Delete Tag. Don’t worry. Deleting a Tag won’t delete the items; it just removes that Tag from every item. Show All Filename Extensions check box: Tells the Finder to display the little two-, three-, four-, or more character filename suffixes that make your Mac’s file lists look more like those of a Linux (or Windows) user. The Finder hides those from you by default, but if you want to be able to see them in the Finder when you open or save files, you need to turn on this option. Show Warning Before Changing an Extension check box (on by default): Allows you to turn off the nagging dialog that appears if you attempt to change the two-, three-, four-, or more character file extension. When Performing a Search pop-up menu: Lets you choose the default search location when you initiate a search as described earlier in this chapter. Your choices are Search This Mac, Search the Current Folder, and Use the Previous Search Scope.